If your 6 month – 8 month old baby is just starting solids at this stage, start slowly, preparing a very small amount of whatever food you have chosen to begin with. Nurse or bottle feed your baby first and then offer your little one solids. It’s important to remember that baby’s milk continues to be more important than solids at this age – don’t worry when baby won’t eat more than a few bites. What to Eat at 6 to 8 Months of Age? AGE & STAGE – 6 months to 8 months oldThe AAP recommends that an infant not be started on solid foods until after 6 months of age. Many pediatricians still start babies on solids around 4 months of age. This chart accommodates all ages and stages up to 12 months. Try mixing together the grains that your baby has had without any reaction(s) – Brown Rice and Oatmeal with Pear Sauce for example. Begin making your own fruit combinations once baby has had several fruits without any reaction(s). After 8 months old – you may wish to try offering raw ripe fruits. Soft cooked fruits make for great beginner Baby Finger Foods; Learn about Introducing Baby Finger Foods. Veggie combinations are great to offer now. Ensure that all veggies have been previously offered without any reaction(s) prior to mixing & matching. After 8 months old – you may wish to try offering soft cooked veggies in dices or tiny chunks and bits. Soft cooked veggies make for great beginner Baby Finger Foods. Once your baby has reached 8 months old, try offering tofu finger cubes dusted with Cheerio “dust” or other cereal “dust”. Many pediatricians are now recommending Meats as first foods due to the Iron content – ask your pediatrician. Around 8 months old, you should be able to offer plain whole milk yogurt and mild cheeses to your baby. Many pediatricians even suggest yogurt as a great first food as early as 6 months of age. Mix some yogurt with a favorite fruit puree for a breakfast offering. Visit our Offering Your Baby Yogurt page for more information on introducing Yogurt and Cheese. More and more parents are opting to skip traditional baby food purees and choose Baby Led Weaning as a method for introducing solid foods. Baby Led Weaning means offering your baby (age appropriate) foods that soft-cooked and cut into small easily manageable pieces. These foods are then given to your baby to eat. You do the cooking, the dicing and the offering of the foods and your baby does the rest. As with breastfeeding on demand, Baby Led Weaning is a method of introducing solid foods that leaves it up to your baby to decide when and how much to eat. 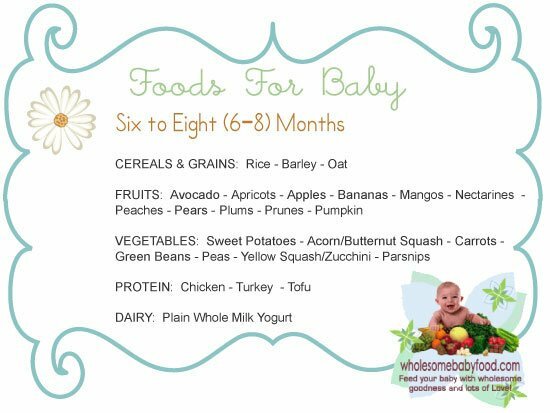 While not necessarily a “hands off” approach, The foods listed on our 4-6 month old chart and those listed on the chart here make great foods for introducing solids using the baby led weaning method! How much will my 6 month to 8 month old baby eat at his first meal? If your 6-8 month old baby is just starting solid foods, you will probably only manage to have baby eat 1/2 of the tablespoon sized portion the very first times you begin solids. If you are using a Baby Led Weaning approach, your baby may only manage to get a few pieces of food into his or her mouth. Don’t fret if your baby does not “finish” a meal. Remember this is a new experience for your baby. As your baby becomes accustomed to eating solids, you will gradually increase the portion sizes. Remember, breast milk and/or infant formula are providing for the total nutrition of your baby at this stage. Read How Much Food Should My Baby Eat page for more information. Many parents find their babies will push the food out of their mouths on the first few tries. This is normal however it may also indicate that your baby is not yet ready for solid food.Only you know your baby and will be able to decide if baby is truly ready for solids. 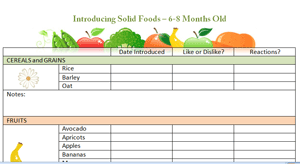 Download the new 6 to 8 month old food diary chart! Want to keep track of the foods baby likes and dislikes? Download the free PDF above to keep track of what baby likes to eat, the date of introduction and any allergic reactions baby may have had. The charts presented are general guidelines with solid baby foods that are age appropriate. They may seem somewhat conservative in nature compared to guidelines from other sources. We show age-ranges for different foods and we have researched and compiled these charts from various medical authorities such as private pediatricians, the AAP, the AAFP and the WHO. Feel free to print the chart and ask your Pediatrician about the listings and recommendations. Our visitors say their pediatricians are impressed with our Chart’s suitability and accuracy of listings.